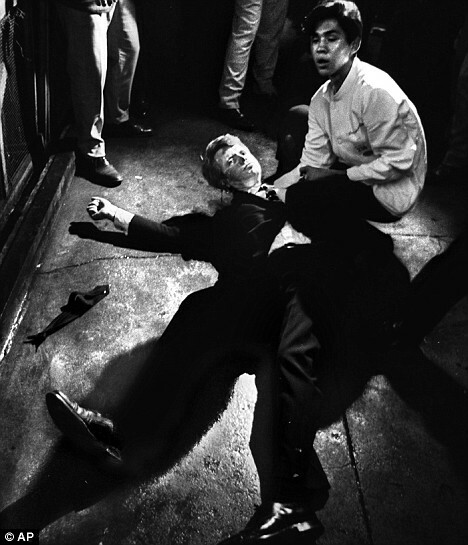 On June 6, 1968, Robert F. Kennedy was shot and killed as he walked through the kitchen of the Ambassador Hotel in Los Angeles, CA, and died in the Good Samaritan Hospital twenty-six hours later. Sirhan Sirhan, a 24-year-old Palestinian immigrant, was convicted of Kennedy's murder and is serving a life sentence for the crime. Robert Kennedy had just won the California primary election for the Democratic nomination for President of the United States. Many believe that a second gunman was present at the Ambassador Hotel (anyone with common sense really). According to an Associated Press report, this year, through legal papers presented by his lawyer, William F. Pepper, Sirhan said under hypnosis that on a cue from a mysterious girl in a polka-dot dress, he went into "range mode" believing he was at a firing range and seeing circles with targets in front of his eyes. The story of the girl has been a lingering theme in accounts of the events just after midnight on June 5, 1968, when Kennedy was gunned down in the hotel pantry after claiming victory in the California Democratic presidential primary. Witnesses talked of seeing such a female running from the hotel shouting, "We shot Kennedy." But she was never identified, and amid the chaos of the scene, descriptions were conflicting. Through the years, Sirhan has claimed no memory of shooting Kennedy and said in the recent interviews that his presence at the hotel was an accident, not a planned destination. Under hypnosis, he remembered meeting the girl that night and becoming smitten with her. He said she led him to the pantry. Sirhan's attorney is William Pepper, a lawyer with an international practice, who previously tried to prove that James Earl Ray was not the assassin of Martin Luther King Jr. The lawyer said he is convinced that Sirhan was a victim of a mind control project such as those used by the CIA in the 1960s. He is seeking an evidentiary hearing to exonerate Sirhan in Kennedy's killing. Pepper has been active in other government conspiracy cases including the 9/11 Truth movement and has advocated that George W. Bush be charged with war crimes. Watch part 4 of the above linked documentary, Evidence of Revision, on the assassination of RFK, and be sure to check out the rest of the Evidence of Revision series. It is an extremely comprehensive documentary with amazing footage.